Brigadier General Alonzo L. Ferguson was commander of the 21st North American Air Defense Command Region at Hancock Field, New York. He also served as commander, 21st Aerospace Defense Command Region and as commander, 21st Air Division, the air defense component of the Tactical Air Command. He is responsible for air defense operations in the northern United States and portions of Canada. 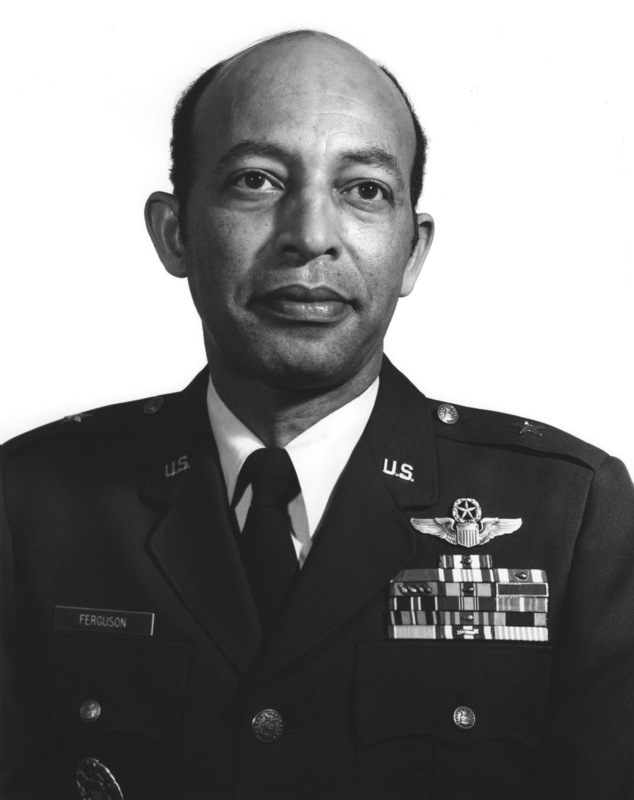 General Ferguson was born in 1931, in Washington, D.C., where he graduated from Dunbar High School in 1947. He graduated from Howard University in June 1952 with a bachelor of science degree in psychology and was commissioned a Second Lieutenant in the U.S. Air Force through the Reserve Officers' Training Corps program. He is also a graduate of the Armed Forces Staff College at Norfolk, Virginia. He began active duty in July 1952. After completion of flight and jet fighter training, he served in Korea as a T-6 "Mosquito" forward air controller from July 1954 to June 1955. He was then assigned to the 4520th Combat Crew Training Wing at Nellis Air Force Base, Nevada, where he instructed in T-33s, F-86s and F-100s. From June 1961 to September 1964, General Ferguson served at Wheelus Air Base, Libya, as an F-105 weapons instructor. He also acted as liaison officer for the 36th Tactical Fighter Wing from Bitburg Air Base, Germany, which conducted weapons qualification training at Wheelus. Following this assignment he returned to Nellis as an F-105 instructor pilot and operations officer for the 4523rd Combat Crew Training Squadron. In August 1966 General Ferguson entered the Armed Forces Staff College. In April 1967 he was assigned to Takhli Royal Thai Air Force Base, Thailand, and flew 103 combat missions with the 355th Tactical Fighter Wing in F-105s over North Vietnam. General Ferguson served at Headquarters Tactical Air Command, Langley Air Force Base, Virginia, as chief of the weapons systems branch under the deputy for operations from January 1968 to July 1971. He was then assigned to Headquarters U.S. Air Force, Washington, D.C., for duty in the Tactical Weapons Systems Branch of the Directorate of Operations and in the Air Force Board Structure. General Ferguson returned to South Korea in February 1974 and served until February 1975 at Osan Air Base as vice commander and commander of the 51st Air Base Wing, and commander, 51st Combat Support Group, 51st Composite Wing (Tactical). He was named vice commander of the 355th Tactical Fighter Wing at Davis-Monthan Air Force Base, Arizona, in March 1975 and took command of the wing in February 1976. He became deputy director, J-3, National Military Command Center, Joint Staff, Organization of the Joint Chiefs of Staff in August 1977. General Ferguson was appointed deputy director for readiness development, Directorate of Operations and Readiness, under the deputy chief of staff for operations and plans, Headquarters U.S. Air Force, in September 1978. General Ferguson assumed his present duties in June 1979. A command pilot, General Ferguson's military decorations and awards include the Silver Star with oak leaf cluster, Legion of Merit, Defense Meritorious Service Medal, Meritorious Service Medal with oak leaf cluster, Air Medal with 13 oak leaf clusters and Air Force Commendation Medal with oak leaf cluster. He is a member of the Daedalians, Air Force Association, and Red River Valley Fighter Pilots Association. General Ferguson was promoted to Brigadier General August 1, 1977, with date of rank July 28, 1977. General Ferguson died in 2007 and was buried with full military honors in Arlington National Cemetery on 12 September 2007.